This Revelation Timeline Decoded Bible study focuses on the seventh seal of Revelation 8. Here’s a short summary of the fulfillment of the 7th seal of Revelation 8, then a video will give more details, followed by a verse by verse explanation. It represents the Lord preparing to blow 7 trumpets of war against the pagan Roman Empire, when he sent army after army against them. Revelation 8:1, “When He opened the seventh seal, there was silence in heaven for about half an hour. In the context of the historical fulfillment of the seals of Revelation, when Constantine gave the Edict of Milan in 313 A.D., it gave liberty to the Christians, and there was peace for a little while. 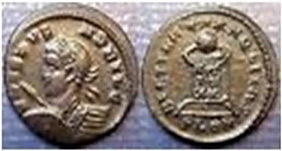 There was a coin minted during this time that said “Beata Tranquillitas” which means “Blessed Tranquility”. So why did the Lord switch from Seals to Trumpets? In the Old Testament, the blowing of trumpets was often used to proclaim that God was about to pronounce judgment upon a wicked system, city, country or people. As you’ve seen in the previous studies, Jesus executed justice against the Roman empire causing it to collapse, and He will continue to pour out His wrath during the 7 trumpet judgments.